So, based on the votes of the twitter hive mind and my Facebook fans I went with purple instead of blue on this round of hair coloring. Why the color change? Well, why not? I’ve done purple, pink, and blue all before, and was it was a toss-up between purple and blue in my mind. Well, here are the results. Note: the colors appear brighter in person than on film, and I’m not sure why? You’ll notice in sunlight, from the back the effect is dramatic. However, in the next shot, it’s difficult to see the color on the tips. 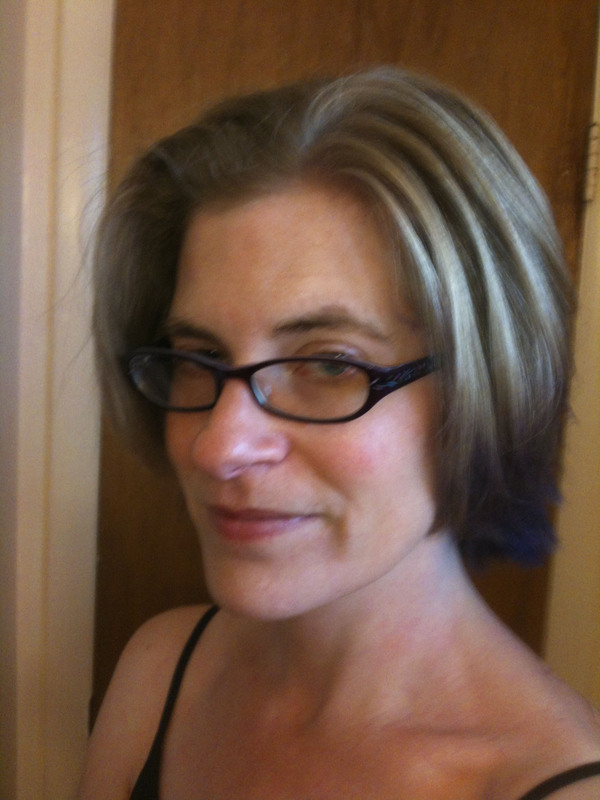 In fact, it almost looks like my hair is much shorter, like the color has gobbled it up. Chomp chomp chomp! So, if you’re wondering how I do this wacky thing with my hair, here goes. I’ve done it several times now, so I have the method down. 1) Go to a beauty supply shop. Get gloves, color spot remover (for your skin), sulfate-free shampoo and conditioner, an applicator brush, a highlighting brush, the color of your choice, a packet of tin foils, a bowl for the colorant, and a color sealer (Ask someone who works there for a good brand. This will keep the color longer.). Color Jamz – this one lasted a bit longer IMHO, perhaps 12-18 washings. NRage Color – Demi-Perm Color, not a range of colors, but will last 28 washings, I’ve gone with Plum Purple on this one today. 2) Put a towel you hate on the floor. No really, these dyes go everywhere, and you don’t want your carpet forever banana yellow, or whatever. Also, get naked. You don’t want your clothes mucked up either, right? Well, whatever, don’t send me your cleaning bills. 3) Put the gloves on. Leave them on until you’re done showering, or your hands and nails will turn apple green. Feel me? 4) Section your hair from the crown down into segments and clamp it to your head with those little hair clampies, whatever they are called. 5) The area of your hair from your ears down, leave free. 6) Squirt color into the special color bowl. By the way, if you’re wanting to mix colors, do it now, and mix it well. Now, this bowl has a nifty rubber foot so it won’t slide around and fall onto the floor. Not like that first time when you did the wine pink and you didn’t think you needed the special bowl and it slid off the counter and onto the shower rug. Hello! New shower rug! 7) Take the applicator brush, the thick one and coat all the hair below your ears with color. Use plenty, don’t be a stooge! 8) Did I mention you need a rag or two? Oh yeah, get thyself a rag, and rub all the messy colorant from your hands onto this rag, which you’ll throw away later. This is best for everyone, really. If you put it into the laundry, your machine is hosed, as are your clothes, FYI. Also clean off the applicator brush, as you’re done using that one. 9) Take a piece or two of tin foil and cover your lower mass of gooey hair with it. This will keep it from getting the upper hair all ruby red. 10) Undo the next segment of hair, but just one layer up, not all of them. Don’t get hyper! Get the highlighter applicator and douse it with some of the colorant. Now, being a brave and yet carefree monkey, paint segments of the newly released hair with the colorant, but just the bottom 1-3 inches. It’s your choice how much or how little to do. Don’t keep to a pattern, and skip around a lot. 12) Once you’ve finished that layer, clean off your hands and the handle of the applicator on the rag again. Now, this is very important! Mix in some conditioner into the colorant. “Some.” And incorporate it well. This will lighten the successive color imparted on future layers. Now, let down another segment, and repeat the process in steps 10 and 11 above. 13) Continue until you’ve painted all of your hair tips. After you’re done, wait 15-20 minutes, and then shower. Use the sulfate-free shampoo and the color sealant. 16) Dry and style as normal. 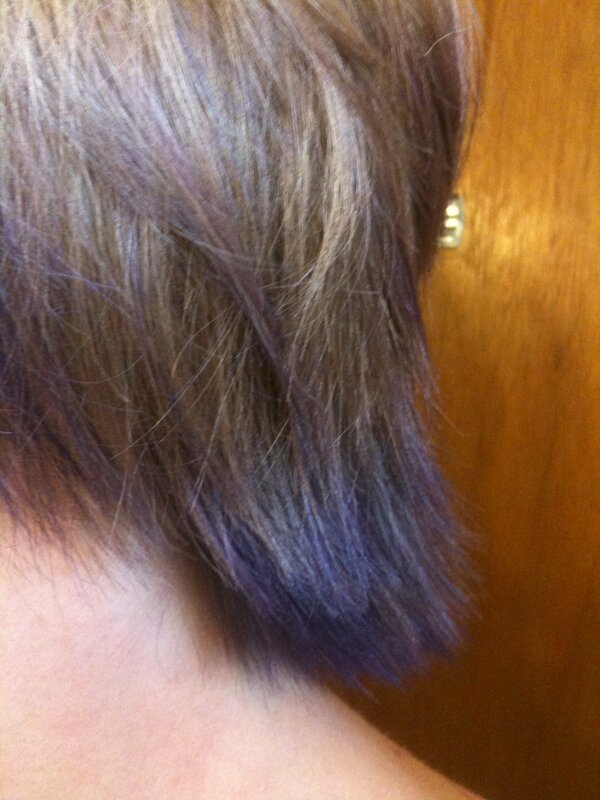 You should have a close approximation of my faded out tips and peekaboo color do. More or less. 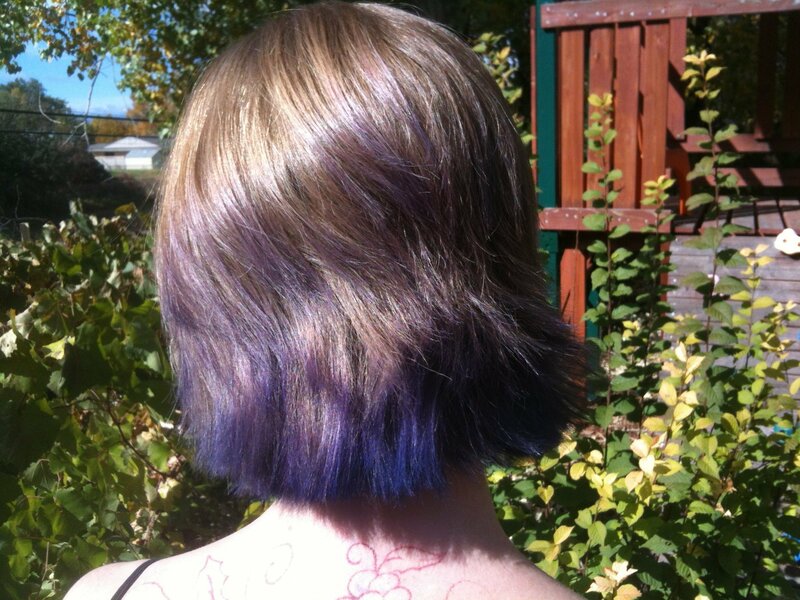 After you’ve done all of this, if you hate the color, try using a product like ColorOops to reverse the process. However, be warned, with these special dyes the color won’t always come out all the way. It may just reverse the color. I tried taking a bright pink out once and got deep blue, so, good luck with that.